We’re in a Golden Age of animated motion pictures. When I was a kid growing up in the 1980s you got one, maybe two films from Disney in a calendar year, plus the odd independent movie like Watership Down or The Secret of NIMH, or some arty foreign language thing with bad dubbing, but that was about your lot. Since the Disney renaissance began in 1989 with The Little Mermaid the strength and popularity of the animated feature has grown exponentially, to the point where every major studio has its own animation department, well over a dozen full length feature animations are released each year, and companies like Pixar break box office records with apparent ease. The competition is fierce, but the Dreamworks studio seems to have managed the right blend of hip comedy and family-friendly action, spinning off from their massively successful Shrek series with hits such as Kung Fu Panda, Madagascar, and their 20th and most recent feature, How to Train Your Dragon. Based on a popular children’s book by Cressida Cowell, the film is a tale of Vikings and dragons, set on the island of Berk, where fighting dragons is a way of life. Hiccup, the son of the Viking chief Stoick the Vast, is a brainy outsider with a smart mouth who and would rather not grow up to fight dragons; he is a terrible embarrassment to his father, who in an attempt to ‘toughen up’ the boy, sends him to the dragon-fighting school of Gobber the Belch. However, rather than becoming the fearsome warrior his father intended, Hiccup inadvertently saves the life of and befriends the dragon he was supposed to kill… The film stars the voice talent of Jay Baruchel, Gerard Butler, Craig Ferguson, America Ferrara, Christopher Mintz-Plasse and Jonah Hill, and is directed by Chris Sanders and Dean DeBlois, who previously directed Lilo & Stitch for Disney in 2002. Musically, Dreamworks Animation has been the sole domain of Hans Zimmer and his protégés from Media Ventures and now Remote Control since day one. Having already worked on Antz, The Road to El Dorado, Chicken Run, Kung Fu Panda, and the original Shrek movie, English composer John Powell returns for a sixth time – although, ironically, the first time as a sole credited composer – and has written the best score for the studio since Sinbad: Legend of the Seven Seas back in 2003, and overall one of the best scores of his entire career. The first thing I should point out is that, while he is clearly excellent at music, John Powell could do with brushing up on his geography a ltitle. Powell was obviously playing with the joke that the Viking adults in the film are voiced by Scottish actors – Butler and Ferguson – but may have taken it a step too far by injecting the music of the Highlands into his score too. Bagpipes skirl, whistles dance and fiddles fly in a manner unbecoming a noble Scandinavian gentlemen. It could be that Powell used a Swedish säckpipa or a Norwegian Hardanger fiddle and not one of their Celtic cousins from across the North Sea, but there is still a slight, if fleeting, geographical disconnect that occurs, causing a brief moment of puzzlement when the score first begins. This small issue aside, the rest of How to Train Your Dragon is an absolute delight. The word which keeps springing to mind when listening to this music is ‘joyous’. It’s music that wows you with stirring action sequences, touches you with more lyrical material, and slaps a big, silly smile on your face from the first cue to the last. John Powell seems to excel at animation scores more than any other type of film he attempts; the level of inventiveness in works such as Robots, the Ice Age series, and his work with Harry Gregson-Williams on Chicken Run and the Shrek series is obvious, but these scores sometimes have a schizophrenic everything-including-the-kitchen-sink approach that can make the album a disjointed affair, jumping from style to style and theme to theme seemingly at random. 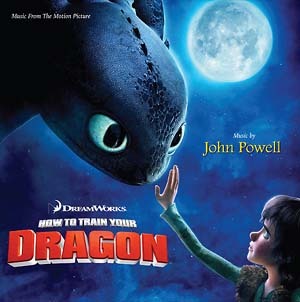 How to Train Your Dragon is not like that; it flows beautifully from start to finish as a cohesive listening experience, and as such is probably Powell’s most satisfying work, in any genre, in years. The opening cue, “This is Berk”, introduces the three score’s main themes. It begins with a noble horn performance of what eventually becomes the score’s ‘flying theme’, and segues into a sweet woodwind piece for Hiccup and his would-be girlfriend Astrid that recalls the more low-key moments of Chicken Run, before literally exploding into the first performance of the score’s main theme, a rousing anthem for the entire orchestra and a male voice choir that is simply magnificent. The large orchestra/male voice choir/Scottish instruments combination heard here is basically the blueprint for the entire score, with some variation of one of more of these elements appearing in every cue. The main theme re-occurs regularly throughout the score, receiving notable recapitulations in cues such as “New Tail”, “This Time For Sure” and “Astrid Goes For a Spin” to excellent effect. The tender piano performance of the theme in “Where’s Hiccup” is magical. The flying cues, where Hiccup takes to the skies on the back of his scaly friend Toothless, are exhilarating in the best possible way, with the astonishing “Test Drive” capturing the spectacular freedom of flight in no uncertain terms. The music in these cues swoops and dives, and opens into expansive statements of the flying theme which are quite thrilling, especially when the bagpipes and an electric guitar join the orchestra. Listening to this music, you can almost feel the wind in your hair, taking your breath away, as you wheel through the skies. Occasionally, in some of these more open moments, the score reminds me of Hummie Mann’s vastly underrated score for Year of the Comet, and those few who are familiar with that excellent work will know what a compliment that is. The action music is equally superb; energetic, tuneful, creative, and often featuring statements of or more of the main themes. “Dragon Battle” has some fearsome low brass chords mixed in with propulsive, urgent rhythmic writing, providing the fire-breathing beasties with a sense of menace and danger. Later cues such as “The Downed Dragon”, “Dragon Training”, “Focus, Hiccup”, “Dragon’s Den”, “The Kill Ring” and the astonishingly intense “Counter Attack” are no less entertaining, running the gamut of emotions, occasionally tense and nervous, occasionally downright threatening, but often embracing a free-wheeling, carefree vitality that is a pleasure to experience. In each of these cues, the power generated by the orchestra, and the way in which Powell orchestrates each section with such apparent ease, is outstanding. The score is not all bombast and histrionics, though. “Forbidden Friendship” has a dreamy, almost New Age vibe, with an unusual tick-tock percussion element highlighting marimbas and xylophones, a breathy female vocalist, and even sleigh bells, which gradually reveals itself as a creative variation on the flying theme. “See You Tomorrow” is a toe-tapping Highland reel with fluttering pennywhistles forefronting several huge thematic performances, and is probably the closest Powell has come to recapturing the vitality of “Building the Crate” from Chicken Run in over a decade (still one of the highlight cues of his career). The romantic theme for Hiccup and Astrid, hints of which appear in the opening cue, is expanded in the glorious, sweeping “Romantic Flight”, another one of the score’s many high points. The score’s finale, from “Ready the Ships” through to “Coming Back Around”, represents 20 minutes of the best action music of John Powell’s entire career. “Ready the Ships” had a determined, expectant feeling, although the hocking male voice choirs and martial percussion hits do give way at one point to a more subtle, reflective sequence which is quite lovely. “Battling the Green Death” is utterly spectacular, and even has a sequence of Erich Wolfgang Korngold/Max Steiner-style swashbuckling adventure music which gives the cue a wonderfully nostalgic Golden Age feel. When Powell restates the flying theme at around the 4½ minute mark, and in the conclusive “Coming Back Around”, the music absolutely soars. Possibly the only misfire on the album is the song at the end of the album, “Sticks & Stones” by Jónsi, better known as Jón Þór Birgisson of the Icelandic rock band Sigur Rós. I like Sigur Rós, and having an actual Scandinavian artist contribute to the project makes sense, but the downbeat introspection and morose style of Birgisson’s music seems even gloomier considering the nature of the music that preceded it. It’s very rare that one can listen to an entire 70+ minute album and honestly say that all of them have musical merit, but that is genuinely the case here. Usually scores of this length have a fair amount of filler, and would benefit from a bit of editorial pruning to get it down to 45-50 minutes, but on How to Train Your Dragon every cue has worth, either through a thematic restatement or a new and interesting texture. What I also like a great deal about this score is the clarity of its sound. Although for a great deal of the running time the entire orchestra is in play, in virtually every cue there is a moment where one specific instrument will come to the fore in a featured performance, just for a couple of bars; the opening cue alone has moments for clarinet and harp that are excellent. Later, in “The Dragon Book”, a harpsichord pops up playing off brass triplets – and that’s just one of literally dozens and dozens of moments throughout the score that make you sit up and take notice. I’m running out of superlatives now, but I think I’ve made my point. How to Train Your Dragon is a 5-star score all the way, a fine example of modern film music which reaffirms my faith in John Powell. I have to admit that, in recent years, his Bourne Identity urban thriller style had started to try my patience, and I was beginning to wonder whether the composer who impressed me so much at the turn of the millennium was ever going to come back. Thankfully, he has, and with a score which sets the benchmark for 2010 almost impossibly high. In an already crowded market it’s an early contender for score of the year, and anyone who revels in old fashioned thematic orchestral writing will absolutely love it. Music composed by John Powell. Orchestrations by James McKee Smith, Paul Mounsey, John Ashton Thomas and Angus O’Sullivan. Recorded and mixed by Shawn Murphy ad Nick Wollage. Edited by Adam Smalley. Album produced by John Powell.